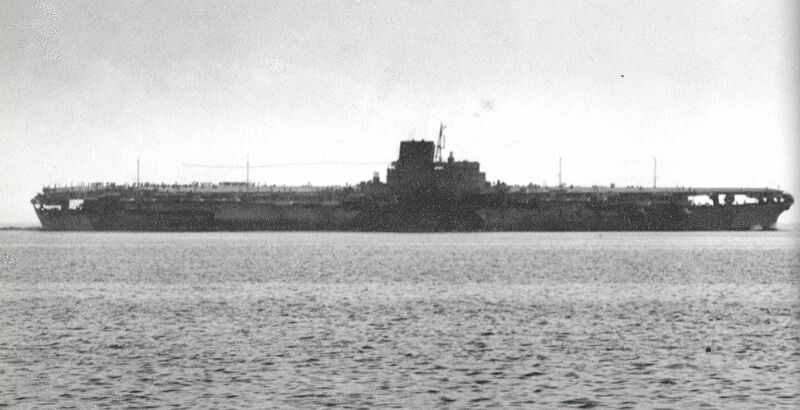 Shinano Japanese Aircraft carrier in 1944 during sea trials. The Japanese Aircraft Carrier Shinano was built by the Imperial Japanese Navy (IJN) using the hull of the third super-battleship of the Yamato class. She was laid down in May 1940. The defeat of the Imperial Japanese Navy at the Battle of Midway had important consequences. The mistakes and problems detected in that battle were used to improve the future carriers of the Imperial Japanese Navy. In particular, fueling and arming doctrine and environment were modified. Large parts of the Shinano hangars were left open for better ventilation, although steel shutters could close off most of the hangar sides if necessary. This also allowed severe damaged or burning aircraft to be jettisoned into the sea, something that the earlier carriers could not do with their enclosed hangars. In spite oh her large size, the airwing was not big. The reasons for this are still unclear. It may have been because of the lack of trained pilots by the end of 1944. The planned air group was intended to consist of 18 Mitsubishi A7M Reppū (Allied reporting name “Sam”) fighters (plus two in storage), 18 Aichi B7A Ryusei (“Grace”) torpedo-dive bombers (plus two in storage), and 6 Nakajima C6N Saiun (“Myrt”) reconnaissance aircraft (plus one in storage). Interestingly, the remainder of the hangar space would have held up to 120 replacement aircraft for other carriers and land bases. Although the ship was scheduled for completion in April 1945, works were speed up in order to make her available as soon as possible after then defeat of the Battle of the Philippine sea in June 1944. However, the constructors were not was able to make the new deadline of October. The quality of the works also declined. Trip to Kure without airwing and with Shinyo suicide boats and Ohka bombs aboard. On 19 November 1944, Shinano was formally commissioned at Yokosuka, having spent the previous two weeks fitting out and performing sea trials.The Navy General Staff ordered Shinano to depart for Kure by no later than 28 November, where the remainder of her fitting-out would take place. The escorting destroyers, Isokaze, Yukikaze and Hamakaze, had just returned from the Battle of Leyte Gulf and required more than three days to conduct repairs and to allow their crews to recuperate. Shinano carried six Shinyo suicide boats, and 50 Ohka suicide flying bombs. In a travel to Kure from Yokosuka, she was hastily dispatched. The works had not been completed and she had an inexperienced crew and serious design and construction flaws, lacked adequate pumps and fire-control systems, and did not even carry a single carrier aircraft. She was sunk en route, 10 days after commissioning, on 29 November 1944, by four torpedoes from the U.S. Navy submarine Archerfish. Over a thousand sailors and civilians were rescued and 1,435 were lost, including her captain. This is a Tamiya 1/700 scale assembly and painting required plastic model kit of the IJN “Shinano”, a World War II era aircraft carrier of the Imperial Japanese Navy. She was initially laid down as the third of the Yamato-class battleships, but her partially complete hull was converted to an aircraft carrier in 1942. Model kit features: This is the 1/700 assembly model kit of Shinano, the massive carrier, which was sunk only ten days after being put into commission. The unique hull design of Yamato and Musashi was passed down to Shinano, and has been accurately molded. The hangar under the flight deck has also been recreated, and can be equipped with aircraft. Both the front and rear aircraft elevators can be modeled in the raised or lowered position. The bridge, sloping funnel, and steam pipes have also been modeled with the utmost attention to detail. Kit also features accurate molding of rocket launchers, powerful anti-aircraft guns, and other powerful weapons of Shinano. Kit includes 32 aircraft, including the Ryusei. Since aircraft are molded in clear plastic, leaving the cabin portion unpainted produces a realistic finish. Imperial Japanese Navy aircraft carrier built on the modified hull of a partially completed Yamato class battleship. Kit has waterline hull, detailed flight deck, island, anti-aircraft and dual-purpose weapons, ship’s boats, deck crane and aircraft (6). Completed model is approximately 8.6″ long. Includes 3-view painting guide and decals for flight deck markings.